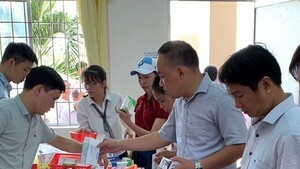 Long An and Quang Nam Provinces announced on March 20 that blue ear disease has now been curbed in many of their localities. The Long An provincial administration has removed bans on transporting, trading and slaughtering of pigs in Chau Thanh and Tan Tru Districts, where the disease broke out in late February. Local veterinarians had quarantined affected areas, culled 83 infected pigs and disinfected farms. The province distributed 65,000 doses of vaccines and 8,000 litres of disinfectants to pig farmers. However, local authorities were asked to reinforce preventive measures to keep the disease in check. The same day, Quang Nam Province annulled similar bans in all 18 districts and towns in the province. More than a month back, the blue ear disease spread to nearly 40 communes of six districts with more than 4,000 pigs infected, over 1,200 of which were culled. Le Muon, Deputy Director of the provincial Department of Agriculture and Rural Development, warned that the epidemic could recur at any time even though it is now showing signs of waning.